You’ve heard before that olive oil is a heart-healthy oil for cooking, baking, salad dressings and stir-fries. However, did you know that there are dozens of oils to choose from, including some that are even superior to the much-praised olive oil? However, unsaturated oils are known to be very unstable when it comes to cooking and baking. You may have heard that when you heat and cook food, it can lose nutritional value. The same goes for fats and oils. Unsaturated vegetable oils can easily go rancid when exposed to air, light and heat (as in cooking). This is why it is important to buy olive oil in opaque containers that shield the oil from any harsh light. Olive oil is also best used for cold and raw recipes such as salad dressing or dips, rather than cooked recipes. What alternative oils are available? Coconut oil is rich in saturated fat and therefore more stable and less prone to rancidity, even when exposed to air, light and heat. If the high level of saturated fat in coconut concerns you, you may be delighted to hear that coconut’s saturated fat is in fact not harmful to your health! Coconut is rich in medium chain triglycerides (MCTs), unlike animal meat, dairy and cheese, which are rich in long-chain saturated fatty acids. MCTs digest easily and are used for energy within the body rather than fat storage. Coconut also has many health benefits, including boosts immunity. You’ll also notice that coconut oil, when solid at room temperature, resembles shortening, making it an excellent healthy swap for baking. Choose organic and unrefined coconut oil for the best health benefits. Palm oil is similar to coconut oil in that is high in saturated fats, specifically medium-chain triglycerides, which provide many healthy benefits. Red palm oil is also rich in vitamin E and coenzyme Q10. With a high smoke point, red palm oil remains stable and nutritionally rich even when heated or cooked. Red palm oil has a deep reddish-orange color, a sign it is rich in carotenoids, which help support the immune system and improve eye health. This oil is great for cooking, baking, sauteing, dips and medium-heat frying. Look for organic, unrefined and raw red palm oil for optimal health benefits. Macadamia oil is not as easily found in the grocery store as olive oil is, but it should be! It contains more monounsaturated fatty acids than any other oil, including olive oil. Macadamia oil has a rich, nutty flavor, and even though it is an unsaturated fatty acid, its smoke point is quite high, making it a great oil for cooking and for raw and cold cuisine. I love avocados, and if you do too, you will love this oil. A common ingredient in beauty products, avocado oil contains the anti-aging and antioxidant-rich vitamin E. Consuming this oil can help you feel youthful and healthy from the inside out. Although nutritionally similar to olive oil, avocado oil has a milder flavor, making it a great choice for cold and raw recipes as well as salad dressings. To receive the most health benefits from avocado oil, choose an organic and unrefined option. This oil is popular in Asian cooking and has a rich, robust flavor, meaning a little bit goes a long way. 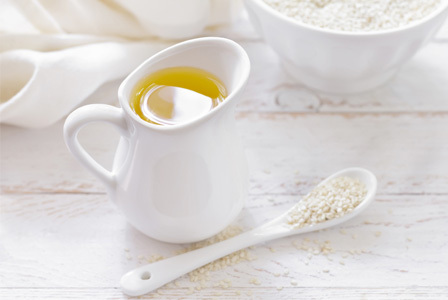 You may be surprised to hear that sesame oil is a good source of copper, magnesium, calcium, iron and zinc. With all oils, choose organic and unrefined versions. For all oils rich in unsaturated fatty acids, choose opaque containers that protect the oil from light, and heat. Store oils in a cool, dark pantry.